Japan, like just about every other nation on earth is today a land standing with open arms as it welcomes tourists from around the world. Millions visit annually for a range of reasons; be they fans of the ultra-modern technology produced within these shore, manga-addicts, lovers of one or more aspects of the local culture or even history buffs out to visit the land of the samurai, shogun and geisha of old. Today, as we take the first steps into the second decade of the 21st century, however, as safe as Japan is when held up alongside other destinations, and as reliable and trustworthy the transportation systems and accommodation options are, things were not always this way. Japan opened to the world in the 1850s and 60s. The so-called Meiji Restoration was centered on a shift in political power from a shogun to an emperor in the years 1867, and 1868, but for a decade and a half prior, the Europeans, Russians and Americans had been knocking at the door, looking to be let in. Early contact between Japan and the then powers of Great Britain, France, and Russia was a political chessboard but it was the USA who opened the door for the Western powers. And, surprisingly as it may seem, it was around the very same time that the earliest ‘tourists’ arrived. Much has of course been written by famed writers as Lafcadio Hearn (1890-1904 in Japan) and others similarly gifted with a pen. Yet with so much changes in three decades in the present – no Internet, CDs or mobile phones in 1981 – the pace of change in the period between Japan starting to open in the 1850s and early 1860s when next to nothing was known of Japan, and the time Hearn arrived in 1890 is today almost impossible to imagine. Most of the early tourists were in fact members of legations sent over by the aforementioned nations. Many combined diplomatic work with travel opportunities, in the process of becoming some of the first non-Japanese to venture away from designated residential and trade areas such as Yokohama near Tokyo, Nagasaki, and even Niigata and Hakodate. Arguably the most celebrated and renowned early ‘tourist’ was Ernest Satow. When he arrived in Japan in 1862, having originally set out from England to work in China, Satow was a low ranking member of the British legation. Language skills honed in the study of kanji during a brief stay in China, and a keen desire to learn the local tongue here soon had him fluent enough to converse with his hosts who were then largely of the ruling elite. Most options available to the early tourists centered on or around the enclaves they called home with perhaps a daytrip here to a local temple, an overnight there between larger cities (read Kyoto and Tokyo/Yokohama although these journeys were often made by boat). Satow did get himself off the so-called beaten track, visited temples and sites then unknown outside Japan and largely inside the nation too, but now national tourist attractions. Along the way he met such notables of the era as Takamori Saigo, and even found time to visit the kabuki when few if any non-Japanese had ever seen it. He is said to have argued against the wish of the theatre staff to charge him extra as a foreigner as was normal at the time – something few Japanese admit today. Another event the population of the modern nation seem to have forgotten, and penned in his personal diary as well as later publications of his memoirs refers to the early site of a British Embassy in a temple in Gotenyama being attacked by a team that included a man later to become Japan’s first Prime Minister – Hirobumi Ito. The legation buildings were destroyed in a blaze that came about as a result of the attack. Satow’s common-law-wife was Japanese – Kane Takeda - as were his children, but perhaps the most visible UK-Japan link the London born Japanophile left behind was the cherry tree collection near the British Embassy – today the most famous in the nation in the area Chidorigafuchi. He died in England in 1929, having left Japan for the last time in 1900. For the lady travellers of the period, the single most famous name of her time was undoubtedly that of Isabella Bird. A 47-year-old from Yorkshire in England when she arrived, Bird is today famous as the woman who walked, used horses, boats and rickshaw to make her way along the inland route from Tokyo to Hokkaido in 1878. She lived for a while in Hokkaido with the Ainu, studying their culture and her trip was recorded in letters sent home to her sister – later collated in book form under the title of “Unbeaten Tracks in Japan”. 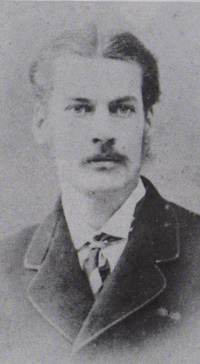 It could be argued by scholars of Japanese history that Edward B. Clarke was never ‘really’ a tourist – having actually been born in Yokohama in 1874. It will not be argued, however, that he never really mixed with the local population, and was the quintessential "Englishman in New York." Clarke was known to have sat “at the feet of one of the masters of modern English prose – Lafcadio Hearn”, made his way through various positions in the prestigious universities of Japan including a tenure from 1921 – 1934 as professor of English Literature at the Imperial University of Kyoto, and even introduced the sport of rugby to the nation. He traveled widely, but as detached from things that might have been fashionable to the Japanese at the time, he never forgot where home was, returning to the land of his birth after extended periods in England and the West Indies. Clarke published in both news and private forums yet his work today is rather hard to find. Should the book listed below be found in a second hand book store it will prove an invaluable addition to any library on early Japanese exposure to the West, and the wit of a man known in his day for referring to the now much cleaner waters of the port of Kobe as comparable to “Maruzen ink” – Maruzen a Japanese stationers and bookstore still in existence. Less dated are his observations on early US-Japanese relations, the traditional footwear ‘geta’ and even comments on his work as an English teacher when assigning written work to students related to the seasons. These words were penned the better part of a century ago, yet, if today rereleased in modern media formats could appear as if written yesterday, so little having changed in the English language abilities of the locals. STRAY LEAVES, ESSAYS & SKETCHES – EDWARD B. CLARKE, KENKYUSHA CO. 1936. Mark Buckton, a Tokyo-based freelancing journalist contributes his articles to a number of world's noted newspapers including The Seoul Times.